Come on, Australia – you can lead the charge! Late in November 2016, I sat (an invited guest) in the Australian Embassy in Tel Aviv and listened to a couple from Down Under place a personal request for their country’s embassy to be moved to Jerusalem. Ambassador David Sharma answered — as a representative of his government is expected to — that Australia would not to be at the forefront of any such effort. Out loud I asked whether here, on the cusp of the 100th year since the 800 Australian Light Horsemen at Beer Sheba played a pivotal role in liberating the land of Israel from Islamic control, enabling the rebirth of the national home of the Jewish people, Australia would not be willing to again ‘lead the charge’? No, came the firm if (I thought) empathetic rejoinder, such an act would be out of sync with modern Australian statecraft. Statecraft, blah-craft! What ever happened to visionary Churchillian statesmanship? Will the Land Down Under really miss this incredible opportunity to set in stone for another hundred years its already extraordinary relationship with the Jewish state – the most rapidly developing and richly contributing country in this part of the world – perhaps in the whole world? And in Hebrew, courage is “Oz”. Just as the mighty British Empire set the stage for the ANZAC victory at Beer Sheba, the groundwork has been laid for Australia to seize the day on Jerusalem, today! More than once, campaigning Donald Trump declared his determined intention to move the United States Embassy in Israel from Tel Aviv to Jerusalem. His daughter, Ivanka, confirmed that he was “100 percent” determined to take this step. After he won, the new President Elect’s closest personal assistant said that making good on this promise was a “big priority” for him. Trump’s designated senior envoy to Israel, David Friedman, expressed his delighted anticipation at working in his ambassadorial offices in Jerusalem. This is good news too – as good as it is predictable. It tells us how crucially valuable this would be – for Israel! The Arabs instinctively shout and wave big sticks. They’ve learned how to terrorise an appeasing world. Some optimistic observers suggested that the outgoing Secretary of State has provided the President Elect – with his reputation for defying the predictions of most so-called experts – with a wonderful opportunity to also prove Kerry wrong. On the same day, right after the 115th US Congress was sworn in, Senators Ted Cruz, Marco Rubio and Dean Heller sponsored the “Jerusalem Embassy and Recognition Act” to relocate their embassy from Tel Aviv. Said Rubio: Jerusalem is the eternal capital of Israel and is where the American Embassy belongs. So far so very good. In fact, it couldn’t get a whole lot better. But it does. A member of the Freedom Party in The Netherlands last month called on the parliament in The Hague to recognize Jerusalem as the capital of Israel and move the Dutch embassy to the city. The President of the Czech Republic Miloš Zeman has called for his country to relocate its embassy to the Jewish capital, and parliamentary efforts are under way to push this. Ukrainian MP Alexander Feldman has called for his nation to move its embassy to Jerusalem. So has Canadian candidate for the Conservative Party leadership, Kellie Leitch, pledged to move her embassy to Jerusalem if she becomes prime minister. So? What’s holding up Australia? In geo-political history, momentous opportunities appear on the horizon, loom into sudden sharp focus, then fade just as quickly to never materialise again. The astute will leap to grab the moment. For Australia, as I see it, this needs to happen today. There is surely a God-given opportunity to do so. In line with the vision shared with Australian Christians on my three visits since late 2014 – of a crown of service and blessing is being offered to that great southland, and it does look as if we’ve arrived at such a moment. Australia can take firm hold of the lead, or it can choose to slip into line to follow. But this may be a moment – a manifestation of grace given the trend of international opinion for nearly 70 years since Israel’s rebirth – that’ll soon be gone. Globally the climate has shifted. Political tectonic plates have moved, creating new openings; forces are being realigned, many pushed by eruptions of Islamic violence televised for the world to see. 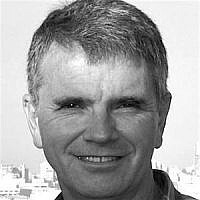 Stan Goodenough is a South African Gentile Evangelical Christian, 27-year resident in Israel, married to Czech national Christian, father of seven Jerusalem-born children, journalist, writer, speaker, accredited tour guide.